The Electric Podiatry Chair with peripheral bar Ecopostural ﻿﻿﻿C5538 is an electric table in 3 parts with an electric height adjustment with a motor controlled by foot rails. The podiatry table has a steel frame with white epoxy powder coating heated at 250º and is equiped with a frontal piece with high resistance polypropylene curved feet and a lateral piece. The Electric Podiatry Chair with peripheral bar Ecopostural ﻿﻿﻿C5538 is adjustable from +75° to -10° and its height variation goes from 47 to 89 cm. 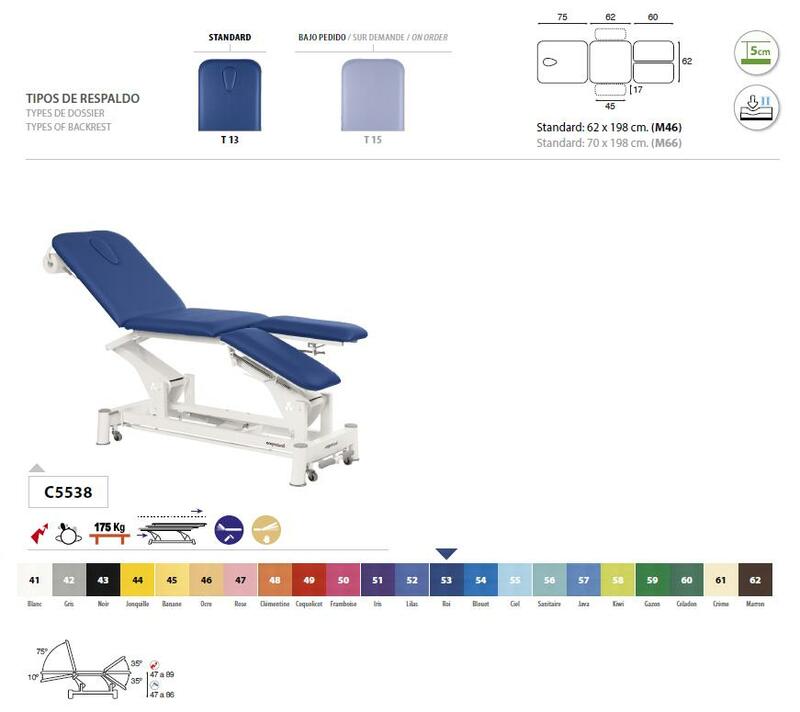 This podiatry table can support a maximum weight of 175 Kg. This podiatry divan presents retractable castors with foot lever and a detachable paper roll holder is included at the end of the massage table. The headrest of the table has an oval breather hole including bung. More info about Electric Podiatry Chair with peripheral bar Ecopostural ﻿﻿﻿C5538 ?